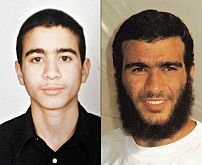 Omar Khadr, the youngest prisoner at Guantánamo Bay was released to Canada on 29 September 2012, ten days after his 26th birthday. Captured in Afghanistan in July 2002 aged 15, his release should have been good news, ending a journey that started halfway across the world and has seen him spend almost half his life behinds bars. Instead, upon return, he was taken immediately to the Millhaven Institution in Bath, Ontario, a maximum security prison, where he remains imprisoned.